You are at:Home»All News»Health»Are stone kitchen benches the new asbestos? Are stone kitchen benches the new asbestos? Last month 22 silicosis claims were lodged to WorkCover in Queensland, including six people who have been diagnosed as terminal, leading to state government intervention. There have been 16 silicosis claims by stonemasons in Victoria, and 23 claims in New South Wales over the past three years, The Urban Developer reports. 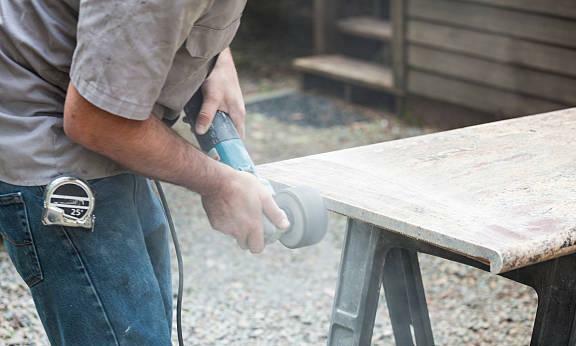 Stonemasons dry cutting stone bench tops are now at serious risk of the irreversible condition, which is contracted by breathing in tiny particles of silica dust that settle in the lungs. The aggressive form of pneumoconiosis is a disease with no cure that traditionally affects coal mine workers. “I’m expecting another 300 cases in Queensland by December alone,” Brisbane occupational physician Dr Graeme Edwards told ABC’s 7.30 report. Labelling the situation “horrendous and alarming, Edwards says 50% of those cases are going to have progressive massive fibrosis. Calls have been made for the government to develop regulations to explicitly ban the practice. Lung Foundation Australia Chief executive Mark Brooke says occupational exposure contributes substantially to the burden of lung disease in Australia and is a growing issue that needs attention. “Symptoms from silicosis may not be obvious and can initially include shortness of breath, chest pain, or a persistent cough,” Brooke explains. Engineered stone is becoming more common as a cheaper substitute to marble benchtops, but is made of around 90% crystalline silica, one of the major causes of silicosis. Both the Thoracic Society and the Royal Australasian College of Physicians are calling for immediate changes, including respiratory health assessments of all past and present stone workers, more vigilant and independent monitoring of dust levels, and an immediate ban on dry cutting.